Want your students to learn about blogging while connecting with others around the globe? 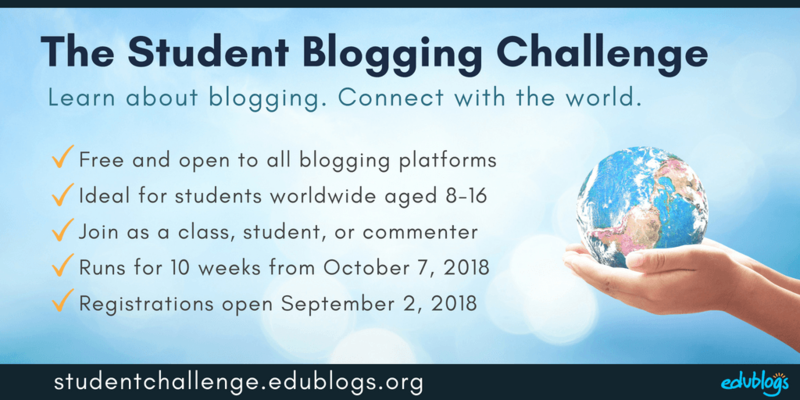 You might want to join me for the next Student Blogging Challenge. It’s free and it’s fun! Tasmanian teacher, Sue Wyatt has been running the challenge twice a year since 2008. She is now stepping down and the baton has been handed … to me! The next challenge begins October 7, 2018. This post explains exactly what the challenge is, who it’s for, and why you might want to add it to your calendar now. While Edublogs supports the challenge, you don’t have to be using Edublogs to take part. Watch this short video to find out more about the challenge and registering. As a class — teachers and students work together on the Student Blogging Challenge tasks using a class blog. Students can publish posts to the class blog or the teacher can post and students can comment. Find out more and register here. As individual student bloggers — students will publish their responses to the weekly tasks on their own blog. Find out more and register here. As volunteer commenters — commenters provide an authentic audience for our student bloggers. Commenters are teachers (active, pre-service, or retired), or other individuals involved in education (e.g. administrators, school leaders etc). Find out more and register here. Commenters can make a big difference in the lives of young people by just dedicating 30-60 minutes a week for 10 weeks! Sign up to our mailing list to stay in the loop with all the challenge news! This isn’t a registration form but you’ll receive updates about the challenge and notifications of the weekly posts once it begins. There’s a lot to be gained from joining the challenge! Of course, students and teachers will learn how to blog and there are SO many benefits of blogging. You never know what sort of learning can take place when you start building connections and finding an authentic audience for students’ work. There is a lot of power in amplifying learning! The more you put in the more you will get out and many participants have found they’ve gained the most when they’ve spent time on building relationships with other classes taking part. So, reading other students’/classes’ posts and leaving them comments; asking questions etc. Connections can span long after the challenge ends. How Does It Work Each Week? Every week on a Sunday, I will publish a new post on the Student Blogging Challenge website. You’ll get an email to let you know about the weekly topic and task when you join our mailing list. There will be a different topic each week. Some topics will be blog skills — like commenting (the first few weeks will focus mainly on essential blogging skills). 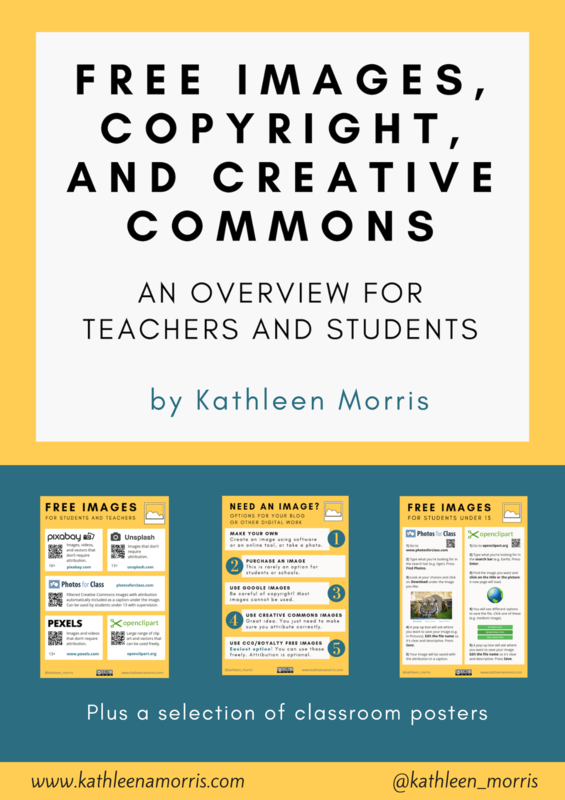 Some topics will be important digital literacy skills like images and copyright. Other topics focus on global collaboration — like learning about holidays and celebrations. Some topics will focus on fun and creativity too — like emojis! After reading through some information and examples, you’ll be presented with a number of options for tasks to complete. The task might be writing a blog post or page, trying out a free online tool, trying an online activity, completing some research, visiting other blogs and leaving comments etc. Nope! You can pick and choose what suits you and your students. Each week there will be a choice of different tasks. Some weeks you might spend a lot of time on a topic. Perhaps opting to complete more than one task. Other weeks you might be busy or the topic might not suit your class, so you can simply skip it. You also have the option to modify anything to suit the needs of your students. If you need to start late or you have holidays that fall during the ten weeks (October 7 to mid-December), that’s not a problem. What If I’ve Never Blogged Before? That’s fine! There are always many participants who are brand new to blogging. While you’ll learn about blogging through the challenge, it can be helpful to start setting up your blog before the challenge begins. Sue Waters from Edublogs and I have been recently updating two self-paced courses that will be helpful if you want to be walked through the process of setting up your blog. What Platform Should I Use To Blog? 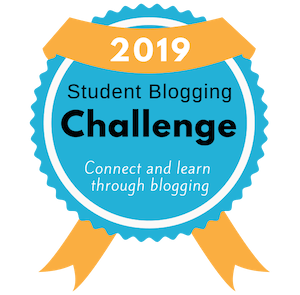 The Student Blogging Challenge has always been open to bloggers who use any platform. I’ve been a fan of Edublogs for 10+ years because I see many benefits of using a WordPress based platform (WordPress powers over 30% of the whole web!). I have written an article about the benefits of WordPress if you want to know more. I’ve created a PDF of FAQs which I’ve embedded below. If I’ve missed anything or you have any other questions you’d like me to clarify, please just leave a comment below and I’ll get back to you!